How do I winterize my motorcycles? I don't. Winter in the Washington metro area (~38th parallel) will have enough occasional ridable days that I keep my bike ready to go. The extended winterizing procedures required for folks living where winter is more severe are sufficiently drastic that I probably wouldn't want to take my bike out of hibernation just for one day. So, I don't do the full up winterizing. The closest I come to winterizing is attaching a Deltran Battery Tender "smart" battery charger. Keeping your battery charged is important because lead-acid batteries can lose as much as half of its voltage through self discharge during the 3 or 4 months of winter disuse. If your bike is parked longer, or in the weather, then an unattended battery completely discharging is not uncommon, especially for casually ridden bikes during their second winter. The Deltran charger, and other "smart chargers", will not overcharge your battery because of built in circuitry to reduce or shut off the charger depending on the voltage of the battery. It's beauty is that you can connect it to your battery and literally forget about it. I keep a quick disconnect (it comes with the Deltran) on the battery at all times with the connector peeking out from under my seat. This makes it very convenient to connect the charger. The only other step I sometimes take is using fuel stabilizer if it looks like a long cold spell is going to keep me from riding. I'd rather take this, probably overkill, precaution than to have to deal with crudded up fuel lines and carbs or injectors. I pour the requisite amount into the tank, then start my bike and let it run for a few minutes to ensure the stabilized fuel is throughout the entire fuel system. The GPS Part 2 post discussed how to use a GPS unit for pre-trip planning. This post will focus on using a GPS unit for post-trip recording, specifically, how to create a record of your trip in Google Earth. 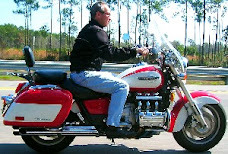 Several years ago I was talking with a venerable motorcyclist about memorable rides. During the discussion, he opened his top box and pulled out a Rand McNally road atlas turning to the page showing the entire United States. On this map he had highlighted in yellow every road he had ridden in the last year. He was proud, and rightly so, of the amount of yellow on the map. All GPS units I've worked with can be put into a mode to record position information (latitude & longitude). Most will record other data including altitude (giving 3-dimensional position), speed, compass direction, etc. These data can be saved as a file (document) on your computer for further processing. To use this feature on most GPS units is as simple as turning it on--read the manual for how. The important setting for this mode is how often to capture the position data. You want to record often enough to create a smooth track of where you've been, but not so often that the position file grows to ungainly size. For long, multi-day trips, the file can be very large. It's important to watch this and download the data to a computer or memory card (a feature of some GPS units) to keep the unit from overwriting earlier data when its memory gets full. If you haven't used Google Earth, you don't know what you're missing. Untold hours can be spent looking at your home, your neighbor's home, your city, your state, other states, other countries, etc., etc. If your computer has the horsepower and you've got a high speed internet connection, you owe yourself this free program from Google. To use GE to view your track data, you must transform the GPS position information into what is called 'KML format' (GE can also read data in the compressed KMZ format). First determine whether the software that comes with your GPS unit will save data in KML format. If it does, you're set. If it doesn't, you need a converter. I have had excellent results with the GPS data converter program GPS Babel. (You'll need to download & install this program. It is 'support ware'--the software is free using the GNU license; the developers request donations. Note that this program runs on many platforms including the Mac...they deserve a donation!) My Zumo outputs position data using the GPX format. With GPSBabel and a couple of mouse clicks I have a KML file ready to be read by Google Earth. It's that easy. If you find GPS Babel a bit daunting, check out the web services at GPS Visualizer for converting GPS data. There is a KML converter at the site that accepts GPS data in a pre-defined format. There is another page that provides a web interface for GPS Babel so you can convert GPS data without having to download the GPS Babel program. In GE you can change the width of your track, make it semi-transparent, change the color, etc. You can also add photos taken along the way. GE can be a platform for recording your memorable rides and sharing with your friends and family. As promised in my previous post on GPS units, this posting describes how to use a GPS for more than watching yourself travel along on a map. One of the most useful features of GPS units is its ability to display a route from your starting point to your destination. The latest units give you turn-by-turn directions with many even "speaking" the directions. Route planning allows you to spend time considering how you want to get to your destination if the shortest or quickest way is not the goal. For many motorcycle rides, how you get there is just as important as arriving. The simplest way to create a route for most GPS units is to enter a destination address and let the unit determine the "best" route automatically. Most GPS units use a version of Dijkstra's algorithm for finding the shortest path from one point to another. I generally use the built-in routing function when I need to quickly get from point A to point B without much regard to how I get there. For most of my motorcycle trips, the calculated "best" route is generally not the route I want to take. When you want to travel a specific route, for example along a scenic highway or to stay off the interstate, you need to manually create the route. Generally, the easiest way to do this is to use the software that comes with your GPS unit. Basically, you will put the mapping program into "route mode", then click points along your desired route from start to destination. The specific steps will depend on your particular mapping program. When finished, connect your GPS unit to your computer (typically via USB), and click the transfer button to download the route to your unit. When you're ready to navigate, choose this downloaded route in lieu of letting the unit calculate a route. If you've been reading this blog, you know I suffered a computer crash that turned out to be more serious than a dead hard drive. This computer was a Windows XP machine so software like Garmin's MapSource and a myriad of other applications for mapping worked without a hitch. I haven't personally done extensive research, but based on information from various podcasts and web sites, it appears most GPS manufactures only provide Windows compatible software. Presently, I'm conducting an experiment to see if I can function with minimal aggravation using a Mac running OS X. A self imposed restriction in this experiment is to avoid purchasing software. This has directed my focus to the web, and so far, I've had interesting results. As I become more experienced in the various tools, I will provide updates through subsequent blog postings. Bookmark GPS Visualizer. There's much info here that I haven't fully digested. It's likely that most of what you want to do with a GPS can be done from this web site. My Garmin Zumo ingests route, waypoint, and tracking data in GPX format. (This is interesting since Garmin has its own proprietary data format.) So, I investigated web services that output route data using GPX. I very much like Google maps. It is easy to enter a starting point and a destination and have Google maps determine a route. You can click the 'Avoid highways' option which keeps the route off of the interstate. Further, you can click and drag the route to other roads or intervening destinations if desired. In short, you can easily create a custom route from start to destination. Google maps also provide turn-by-turn directions and calculate the overall mileage and estimate the travel time. Because of its ease of use, Google maps is an integral part of my motorcycle trips planning. So, an ideal, no cost solution for my Mac is to have some utility that will take the Google maps route data and output a GPX formatted file. Kudos to the author of the Communications From Elsewhere blog who has created a Google maps to GPX converter. 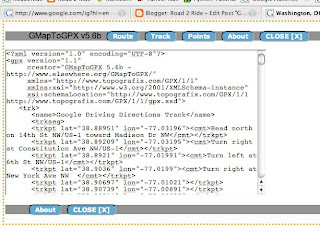 To use it, you need to bookmark the GMapToGPX 'bookmarklet' found at the site. Then go to Google maps and create your route. Click the bookmarklet. A new page is generated with the route data in GPX format ready for cut & paste into any text editor. Transfer this file to your GPS unit and you're good to go. I've found that clicking each option button so they read "Route Track Points" provides me with the best output for my GPS unit. Experiment to see what works best for you. Note, there's no reason you can't use this with your Windows or Linux based computer. Here's what the GMapToGPX bookmarklet provides when clicked. Cut the text from the window and paste into any text editor. Save as a plain text file. Then transfer it to your GPS unit. Post comments if you find this useful. Unless you've been living under a rock, you've likely heard of the Global Positioning System, or more commonly: GPS. It would be difficult to overstate how useful I find my GPS unit. It's worth getting one for no other reason than you will NEVER have to ask anyone for directions--you will never be lost again. and all manner of other data like average moving speed, average overall speed, time of sunrise, etc. The US Department of Defense created the 24 satellite constellation in the late 1970s that makes up the NAVSTAR global positioning system. These satellites transmit coded signals down to earth which are received by a GPS unit. This is why a GPS unit needs to have a view of the sky--it will not work indoors. Determining position is computationally intense--today's GPS units are essentially small, hand-held computers--but conceptually simple. To determine position, the GPS unit measures the time it takes to receive the signal, which is traveling the speed of light, from at least two satellites. Triangulation of these two measurements provides your position on the ground. Using the timing data from a third satellite, the GPS unit can determine your altitude. 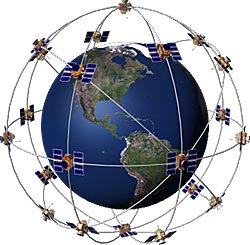 Thus, with at least 3 satellites, your GPS unit can determine your 3-dimensional position anywhere on the planet. The NAVSTAR GPS was intended for use by the US military. Since each satellite transmits its coded signal without regard to where it is pointing on the earth, anyone with a GPS receiver can collect it. To reduce its utility to nonmilitary receivers, an "error" component was incorporated in the coded signal that limited accuracy to about 300-ft for all except US military GPS units. In 1983, President Reagan issued a directive that the NAVSTAR satellite signals could be freely used for civilian applications. The Federal Aviation Administration (FAA) embarked on an effort to employ GPS for use with commercial airlines and was working on an ingenious technique to markedly increase its accuracy. (Note the irony: 1 part of the US gov't was trying to circumvent the efforts of another part of the US gov't.) In 2000, President Clinton issued a directive that the error component of the GPS signal be shut off. Immediately, all existing GPS units were accurate to about 50-ft. Since then, a technique known as differential GPS, DGPS, has been implemented which provides position accuracy down to about 12-ft. DGPS is used in all current commercial GPS units. Another technique known as wide area augmentation system (WAAS), based on the work of the FAA, provides accuracy down to less than 10-ft. The number of GPS units available today is considerable. The FCC required all cell phones built since 2005 to have built in GPS so the phone can be located during an emergency 911 call. With GPS, these phones can have a multitude of other uses including cell phone tracking (keep track of the whereabouts of your child) to providing location based information like directions to a chosen destination. Currently, GPS units come in a myriad of shapes and sizes for use with all sorts of other equipment including portable hand held units, larger units to be mounted in vehicles, and others combined with computers and cameras. The GPS unit I use for motorcycle rides is the Garmin Zumo 450. The Zumo GPS is specifically designed for use on motorcycles: it is waterproof, has large buttons and a touch screen for use with gloved hands, and hardened against vibration. The image below shows the track of several cross country motorcycle rides I've made in the last few years overlaid on Google Earth. In a subsequent post, I'll detail how to make these overlays. It appears my computer crash is a bit more serious than I originally thought. My hard drives are intact (it had 2)--so thankfully I haven't lost any data. I'm making data back-ups now. I'm writing this post using a laptop, which is not my favorite form factor for computers. Not having a desktop negatively impacts my posting frequency. But I will endeavor to persevere. I've got a posting in the works on using GPS when riding. Heads up.